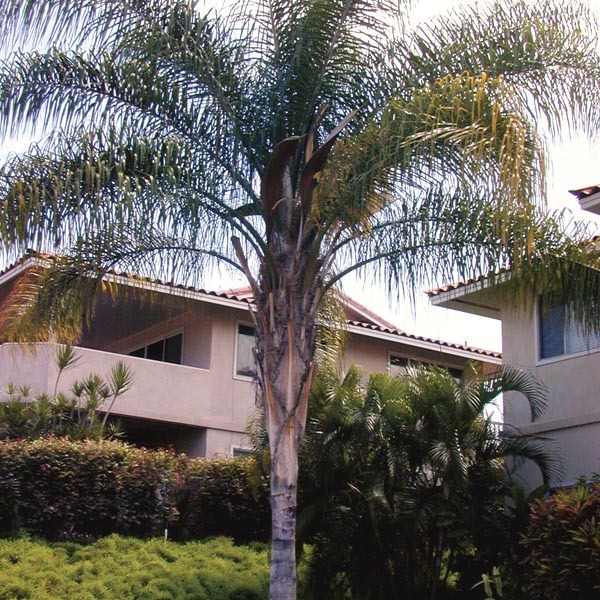 This stately palm is native to South America but thrives in many frost-free climates. The Queen Palm is a fast grower and under ideal conditions it can grow as much as 6' (2m) per year. The tree develops a shallow root system so it's good to keep it well watered through the first year. This will encourage the development of the deepest possible root system, Queen Palms produce small rounded fruits in early winter, called "dates". The fruits are an attractive orange color when mature, but they are not edible. Use as a specimen tree to add a tropical touch to the landscape. Great in containers on the patio or deck and can be grown indoors if ample space and light can be provided. Fertilize monthly. Choose a fertilizer that contains manganese or supplement a balanced fertilizer with manganese. Organic-rich soil, with high amount of sand. Naturally forms a shallow root system so water well until established to keep plant from drying out. Feed regularly with a balanced fertilizer that also contains a range of micronutrients.